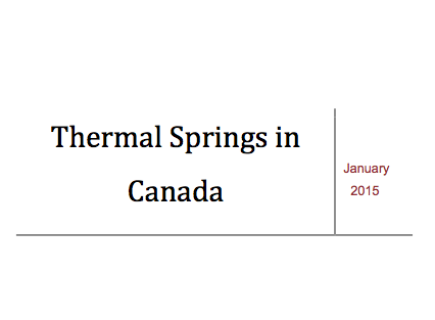 British Columbia has enormous potential to produce geothermal power. There is a sufficient potential to meet the entire Provinces’ power demand. 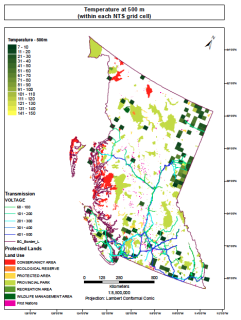 Below you will find the data produced by the British Columbia Resource Estimate Mapping project created using the NTS (National Topographic System) grid cell data commonly used throughout Canada. 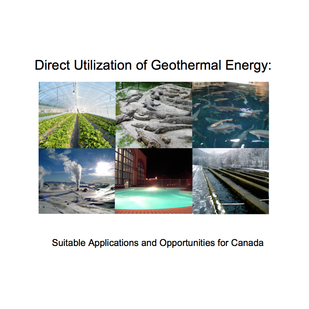 The data has been made available to you to download and use for personal, academic and business use in order to assess and identify geothermal resource potential. The data is intended to serve as a geothermal exploration tool for making informed business decisions and mitigating investment risks. * Please note that the Methods & Data Sources report is not a summary of the analysis of the data, but is rather a summary of the methodology used to produce the British Columbia Resource Estimate Maps. *It should be noted that all of the stated values are approximate and are only relevant to the data that we have available and thus do not fully represent the entire geothermal potential of British Columbia. The NTS system is a grid that has a cell size of 15’ latitude and 30’ longitude that divides British Columbia into individual grid cells. The local thermal structure is estimated for each of the grid cells using a 1D heat conduction model, and then the total potential in the region is estimated by summing together the discrete estimates of each cell. As there is a significant amount of data available for North East BC, this area has been highlighted in the summary. Theoretical Potential: an estimate of “the physically usable energy supply over a certain time span in a given region. It is defined solely by the physical limits of use and thus marks the upper limit of the theoretically realizable energy supply contribution” (Rybach, 2010). In practice, Theoretical Potential was estimated from the total available heat in the accessible crust, assuming 100% recoverability over a 30 year time-frame, and a temperature-dependent conversion efficiency from heat to electricity. Technical Potential: “the fraction of the theoretical potential that can be used under the existing technical restrictions… structural and ecologic restrictions as well as legal and regulatory allowances” (Rybach, 2010). In practice, Technical Potential was derived from the Theoretical Potential by assuming a physical limit to heat recoverability and allowable temperature drawdown. Below the following graphs and table you will find further information and descriptions concerning the classification of Inferred and Indicated Resources. Summary graphs and table are presented with corrected bottom hole temperatures. The Inferred category is intended to cover situations where a Geothermal Play has been identified and limited measurements and sampling completed, but where the data is insufficient to allow the extent of the Geothermal Resource to be confidently interpreted. It is based mainly on indirect measurements, such as the extrapolation of temperature profiles (to a reasonable degree and on a rational basis) and other associated measurements such as rock properties and heat flow, and requires a reasonably sound understanding of the subsurface geology in three dimensions derived, for example, from geophysical surveys, to indicate temperature and dimensions. The Reporting Code was prepared by the Canadian Geothermal Code Committee and published in 2010. It is a required minimum standard for public reporting. If you would like to obtain a copy of the Code, please visit the “Code." The Google Earth program is required to view the following maps. Click here to download a copy of Google Earth. The maps were generated from uncorrected (that is, conservative) bottom hole temperatures. 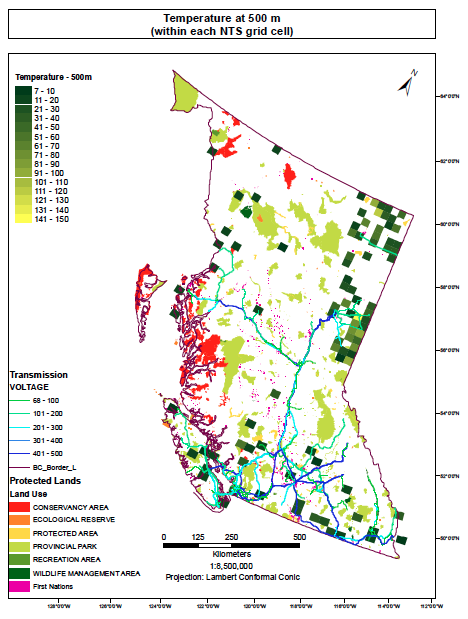 Below you will find the databases used for the generation of the British Columbia Resource Estimate Maps. 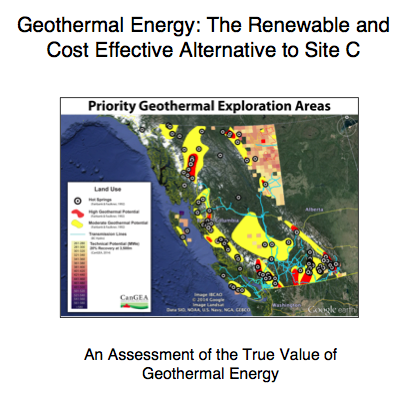 This 60-page report provides an assessment of what CanGEA believes to be the true value of geothermal resources in British Columbia. 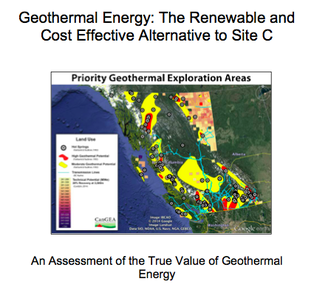 Moreover, it is asserted that geothermal energy as renewable, cost-effective alternative to the Site C hydro dam proposed by BC Hydro. This report builds upon Joint Review Panel (JRP) of the Site C Clean Energy Hearings. The hearings concluded that: “a failure to pursue research over the last 30 years into B.C.’s geothermal resources has left BC Hydro without information about a resource the BC Hydro thinks may offer up to 700 megawatts of firm, economic power with low environmental costs.” CanGEA was granted interested party status at the JRP hearings, and this conclusion largely stems from CanGEA’s submissions. CanGEA considers this number, or 700 megawatts, low. To ensure the true value of geothermal energy is assessed, CanGEA has released The 10 Advantages of Geothermal Energy not Considered by BC Hydro or the Joint Review Panel. Seven of these are economic considerations, and the other three address socio-economic and environmental considerations. The purchase of this report includes a summary backgrounder. A short summary of the key findings.